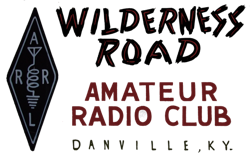 The WRARC held it’s regular monthly meeting at the American Legion Building in Danville. Those in attendance were: KG4UQL, KB4UPW, KD0HYA, KG4VCR, KA4SWT, N4JLT, KF4FMQ, KY4KD, KE4INO, WQ4Z, W8MW, W9WA, K4FT, KK4IYY, KJ4ND, KM4OLL, W9LRR, KB4NST, KI6SER and KI6SEP there were others that did not sign in. We had two visitors from Hawaii. The meeting was called to order by club president Mike May at 7:30pm. We wanted to vote on the Bylaws but we were two members short so we proceeded with regular business meeting. Ken Whitehouse made the motion to dispense with the reading of the minutes from last month as all got a copy by email and approve as written. Dennis 2nd the motion with all members in agreement. Mike asked for a treasury report. There was no questions on the report so Bill made the motion to accept as read. Dan 2nd the motion and all members accepted. KY QSO PARTY: Mike asked John if the Ky QSO Party was still on. John said yes it is in June on the 2nd running from 10am to 10pm. Chris asked if the club was going to run the full time. John said it would be nice even if we had to do shifts to cover the 12hrs. This will be held at the clubs radio station. John said Ken has something that came to the club by mail. Ken held up a plaque from last years Ky QSO Party in which we got 1st place in single station multi operators. There were also awards for that did this event. AL D-STAR NET: The D-Star net went well with 8 members at the club station participating. The next Legion net is April 2nd 8:00pm. This in on reflector 56C. will be out to do yard sale shopping ( sorry Andy ). Bylaws as mentioned before we did not have enough to vote two members short. This will have to be taken up at the April 24th meeting. So with hopes of getting the number we need to vote it was decided that the before meeting meal will be at the American Legion with a cookout that will start at 6:30pm. The club will supply the hamburgers and hot dogs. Chris will supply the condiments to go with. Members need to bring a side dish that will go with meal. With nothing left Ken Whitehouse made the motion to close the business portion of the meeting. Janie 2nd the motion carried by the members. Business closed at 8:01pm. different set ups on design so check out pics. This is a kit no warranty but after checking out the site it’s only where your imagination takes you. He made his box from sheet metal ( by scratch ) so this was time and redoing on some mess ups. There is wiring that can be tricky but most to board is plug and play the rest away from board does require some soldering to different things. You have to pay attention and do research BEFORE you start. He said that he had around 20hrs in his but had the box he bent that took some time. It might take others less or more time just on fast you go but he said don’t go fast take your time. The meeting closed at 8:37pm and members mingled and talked to our visitors to make them welcome.